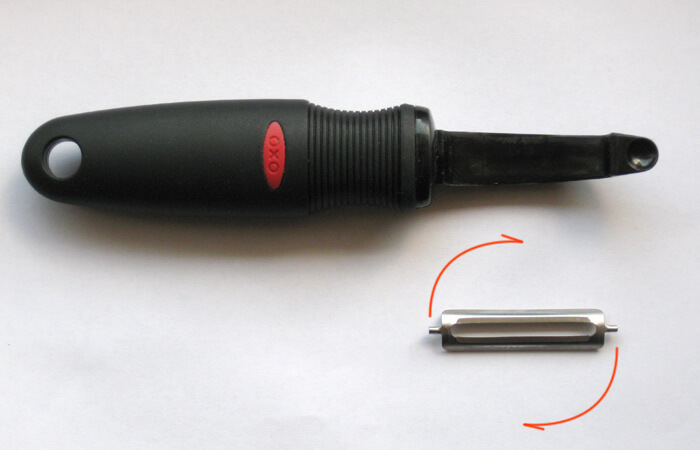 Quick peeler sharpening, step 1: bend the end of the blade-holding arch outwards so the blade falls out. 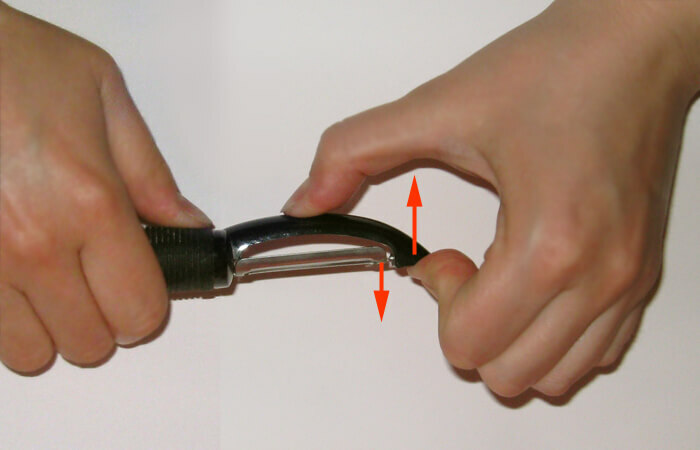 Quick peeler sharpening, step 2: turn the blade and place it back in by bending the blade-holding arch again. the peeler has an arch over its blade or is made of flexible material allowing to take the blade out. Mark the blunt side of the blade before taking it out if you can't easily tell the difference just by looking at it. You may consider wearing gloves to protect your hands from accidental cuts. It is easier to fit the blade back in if you have another person to help you. They can hold the arch open while you are fitting the blade in, or position the blade in place while you are holding the arch. Peelers made of more flexible and better quality plastic with high arches over the blade often cost more than basic peelers. However, if the price is less than double, it still pays off. The blade-turning trick would mean that you can get two blade life-spans for the price of one, while enjoying using a better quality kitchen tool, usually with a mush better handle and better quality steel of the blade. A so-called “Australian” peeler with a high arch over the blade. This peeler is made of strong yet flexible plastic, which makes it bendable and suitable for the quick sharpening described above. This peeler is made of cheap, hard, brittle plastic and has no arch. It either doesn't bend, or breaks. It is more practical to buy the peelers that have an arch and/or are made of flexible materials: they are easier to use because the peels fit freely through the arch, and they will last twice as long because you can turn the blade and make it sharp-like-new again. And, by buying and then throwing away fewer cheap peelers, you will reduce waste and help the environment.